A young girl. A small doll. A world at war. The attack of Pearl Harbor on December 7th of 1941 was the beginning of the devastation suffered by many American and British families living in the Philippines. Over 3,600 civilian families were forced to surrender to the Imperial Japanese Army and live as civilian prisoners in the Santo Tomas Internment Camp. Through My Mother’s Eyes is the gripping account of the life of the Faggiano family as seen through the eyes of my mother, Jean-Marie. The Faggiano family were living in Manila when Pearl Harbor was attacked in 1941, and the following month the Imperial Japanese Army began their occupation of the Philippines. The Japanese captured all non-national civilians and forced them to live in prison camps as civilian prisoners of war for the next thirty-seven months. 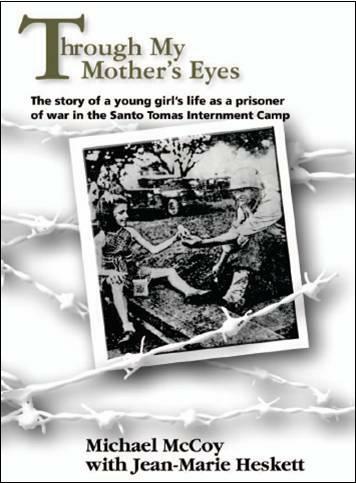 In a world of rampant sickness, starvation, and brutality, daily life within the gates of the Santo Tomas Internment Camp left my mother and her family searching for the strength and courage needed to survive. Watch Jean-Marie and Michael on YouTube! Through My Mother’s Eyes is published by Strategic Book Publishing and Rights Agency.